There are many wrinkle and anti-aging treatments out there for patients who are concerned with the detrimental effects of aging. However, many of these procedures give very immediate and apparent results that may give off a very “done” appearance. For those who are seeking a subtler, more natural looking solution, Sculptra Aesthetic may be the perfect anti-aging treatment. Sculptra Aesthetic is an injectable wrinkle-filler that is made from poly-L-lactic acid. It has been FDA certified to correct the face from signs of aging such as wrinkles and smile lines. Poly-L-lactic acid is biocompatible and is naturally absorbed by the body, and has been used as dissolvable stitches for decades. Sculptra is a collagen stimulator, meaning that the poly-L-lactic acid works to restore the actual structure of the face. Other facial injectables are either toxins such as Botox, which weaken muscles to relax wrinkle lines, or traditional fillers such as collagen fillers, which fill the space beneath defects and give immediate results. By strengthening the collagen structure within the dermis layer, Sculptra subtly rejuvenates the skin and reduces the appearance of wrinkles. 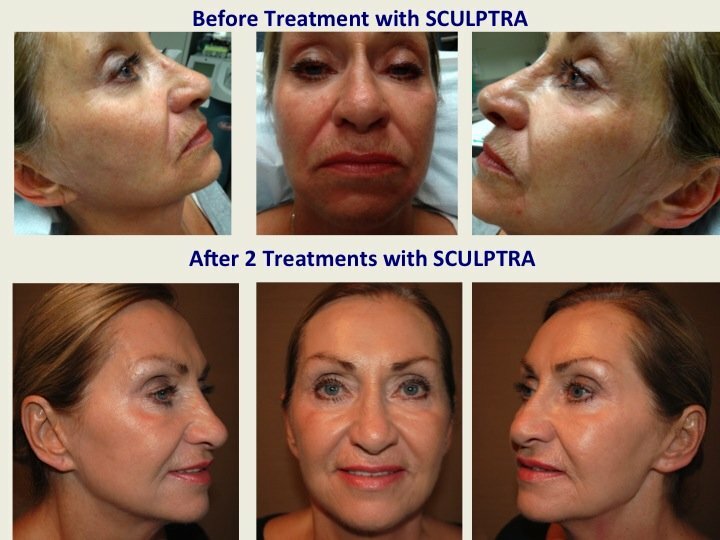 It is important to first have a consultation with a Sculptra trained physician. This will determine if Sculptra is truly the best procedure for the patient, and make sure that reasonable expectations for results are set. Due to the way Sculptra works, results are gradual and may not be visible until several weeks to months after each treatment session. 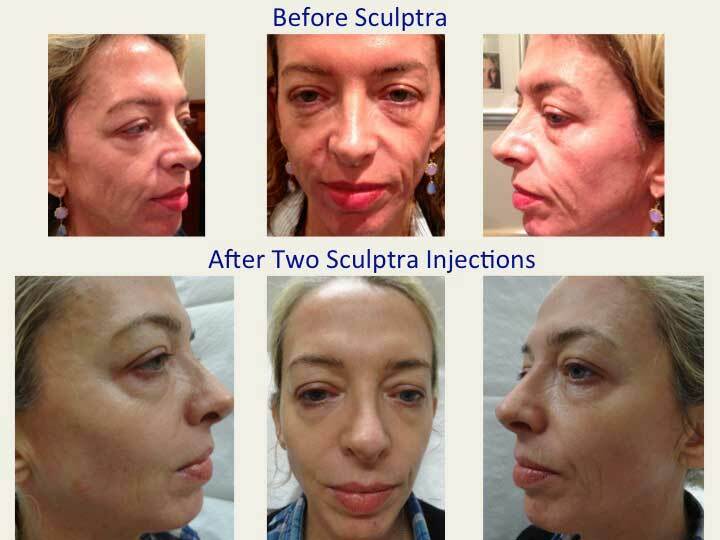 Once Sculptra is determined to be the right solution, the physician will set a treatment plan. On average, patients generally need about three sessions over the course of several months. However, this may be adjusted according to each patient’s skin and needs. During each session, a topical anesthetic may be applied for patient comfort, and Scultra Aesthetic will be injected into the deep layer of the skin. Post-procedure, patients may experience minor redness, swelling, sensitivity, or discomfort at the injection site. Sculptra produces a very natural, rejuvenated appearance with plumper, younger looking skin, and the results can last up to two years after the final injection session. Scultra, in combination with other fillers, as well as Botox/Dysport, can be used to produce a liquid facelift with facial contouring. This procedure, done over time, can restore a more youthful, natural facial contour by lifting jowls, restoring flattened and sunken in cheeks and temple areas, and lifting corners of mouth. Our doctors offer Sculptra to their patients at their quiet and comfortable Upper East Side office in NYC. To see whether Sculptra Aesthetic is the right procedure for you to regain a youthful appearance without any visible signs of having had “work” done, contact his office today for a consultation.